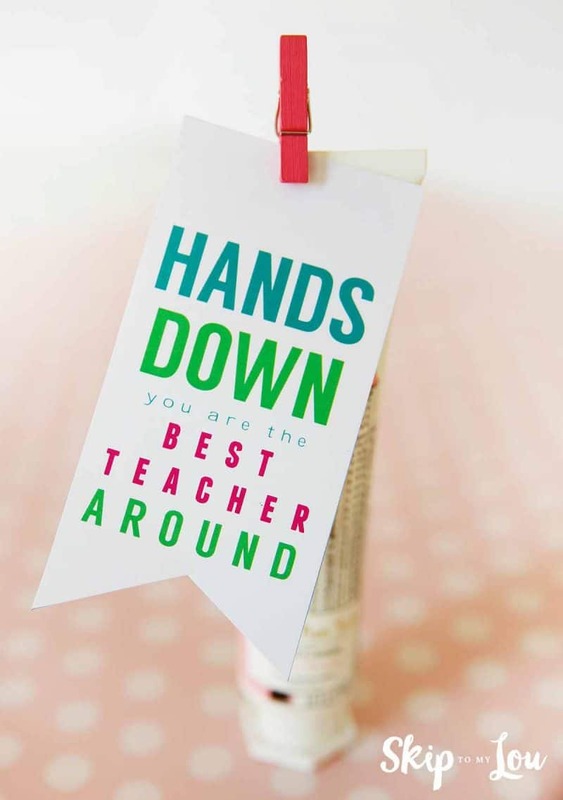 Best Teacher Hands Down Teacher Gift can be a last minute teacher gift to let your teacher know they are the best teacher hands down! It doesn’t get any easier than this. Print off the gift tag, grab some ribbon or a cute clip and head to the store for some hand lotion or hand sanitizer. This can all be done on the way to school! Another great last minute teacher gift is this “Thank you for helping me grow” banner stuck in a pretty plant. Print out the cute banner, tape it to wooden skewers and place in a plant (another item that you can grab at the store on your way to school). Don’t let Teacher Appreciation Week slip by without recognizing your teacher. It doesn’t have to be expensive and a huge gesture, something small and heartfelt says thank you and acknowledges a job well done. I have collected 100’s of teacher appreciation ideas. I hope you can find something special for your teacher. Download the hands down gift tag, print in color on white card-stock. Use a clip, or punch a hole and attach to the lotion. Lovely. I still have a 6th grader who loves to have details with her teachers, and being a teacher myself I found it lovely.